There are really only so many ways to say that I hate Inter. And yet every time I sit down to write a preview, the venom surges within my red and black blood. The veins in my neck and forehead throb and stand out, and my muscles tense up as I feel like I could punch the next thing I see in blue and black. That’s how I know it’s Derby time. It’s all about the bloodlust. There is nothing to have me believe that we could win this one this time. 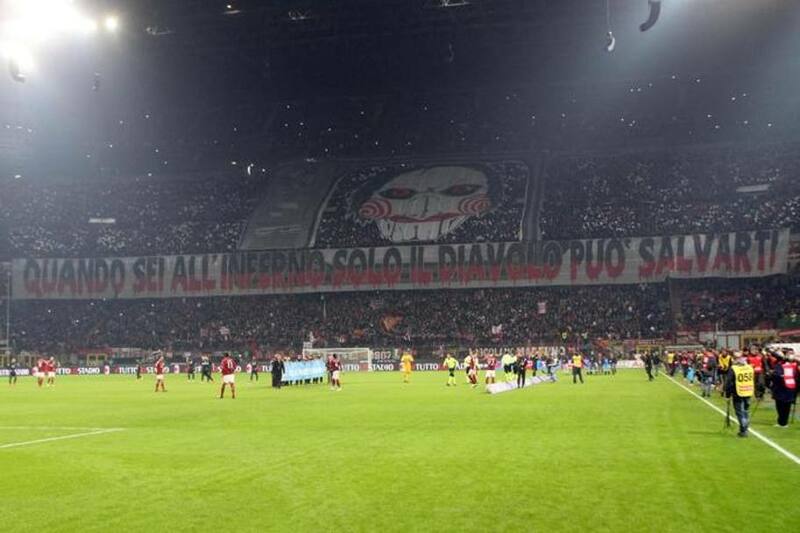 Well, except for the fact that Inter haven’t won at the San Siro since December 15th, having since fallen 2-1 to Lazio, 1-0 to Sassuolo, and drawn 1-1 with the mighty Carpi on Sunday. That draw was thanks to a goal in stoppage time from the now immortal Kevin Lasagna, which was also on the menu at Juventus stadium on Wednesday when Juventus destroyed a 10-man Inter 3-0 in the first leg of their Coppa Italia semifinal. That’s right, it’s been a delicious week of schadenfreude this time around, limiting my personal need to troll, seeing as how Inter have trolled themselves. But before you get too excited about our chances, keep in mind that Milan needed a penalty to take the first leg of our Coppa Italia semifinal against a Lega Pro side. If we can’t even dominate a Lega Pro side, how will we be able to dominate the team that has gone from first to fourth in the league in less than a month? (Schadenfreude is almost as delicious as the lasagna I’m making on Sunday.) But seriously, we are our own worst enemy, and with Milan’s wavering mentality, it’s possible for even that cheating, filthy, scum-sucking bunch of snakes to be awarded a fake penalty and steal three points from us. 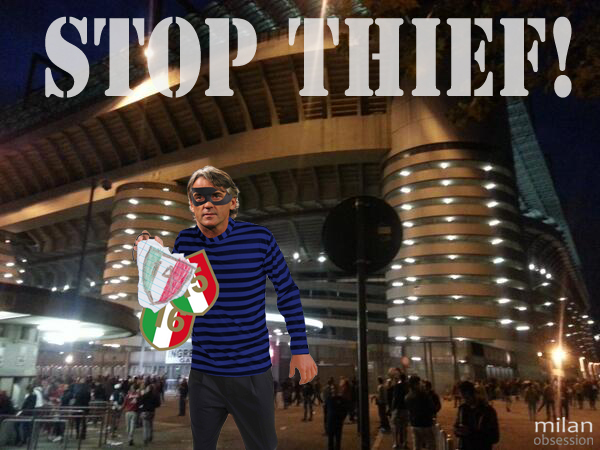 Mancini was given a massive contract and millions of euros worth of quality players. And in fact, they just signed Eder from Sampdoria this week, too. But the only surprise is that Inter were ever top of the table this season. If you think Milan are underperforming, look at Inter’s squad, Mancini’s contract, and their consistency of players in recent years. But even underperforming, they have more potential than us. You know, like when they drew with Carpi on Sunday? Oh, wait. That was just hilarious. For that match, Mancini lined up Handanovic; Juan Jesus, Telles, Montoya, Murillo; Ljajic, Perisic, Brozovic, Melo; Palacio, and Icardi. For the midweek match vs. Juve, he rested some players. His lineup: Handanovic; Murillo, Miranda, D’Ambrosio, Nagatomo; Kondogbia, Medel, Melo; Jovetic, Biabiany, and Ljajic. However he does pretty much have a full squad at his disposal for Sunday. Well Guarin left for China this week, Ranocchia has gone to Sampdoria, and Perisic is in doubt due to fitness as of this writing. There may be other transfer changes before Sunday, as it is the end of the transfer window, but it is unclear if anyone’s contracts will be deposited in time for them to play against us. 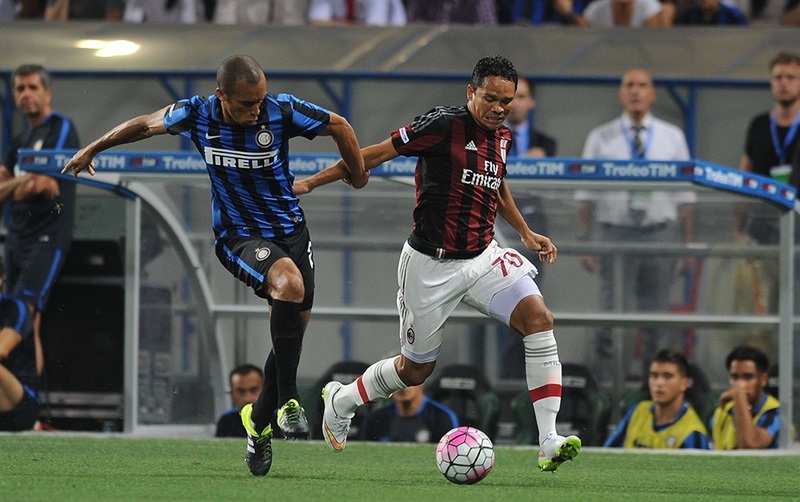 Milan’s mercato has been much easier to write about, as Boateng came in and Suso and Cerci left. That's it. Balotelli is not expected to be fit for the Derby and trained in the gym this week, but both Alex and Bonaventura trained with the team so should be available. Mexes is still questionable as of this writing, but unlikely, and Ely and Lopez are still out to their respective long-term injuries. The biggest question lies over Menez. He was able to train with the team this week for whole sessions, but will he be fit enough for a callup? The Derby is always a fantastic match to watch. Even when it isn’t. 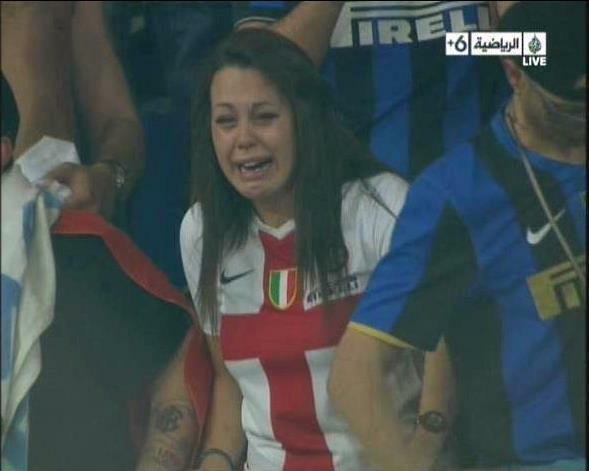 But it’s that much more delicious when Milan win, of course. And speaking of winning, I am so looking forward to Milan’s coreografia, as that is a battle we always win. But aside from wanting to see Inter groveling and crying (that’s the only way I ever care to see them,) I want to see Milan play to our potential. If we play as well as we did vs. Fiorentina, we can absolutely take those hideous, ridiculous, scale-covered slimebuckets. Anything less, probably not. But I won’t give up on the possibilities. It’s win or die trying. Bloodlust. "When you are in hell only the devil can save you"